Blue Line trains resumed service early Thursday morning hours after a derailment near O'Hare Airport injured a woman and forced dozens of passengers to evacuate. Chris Hush reports. 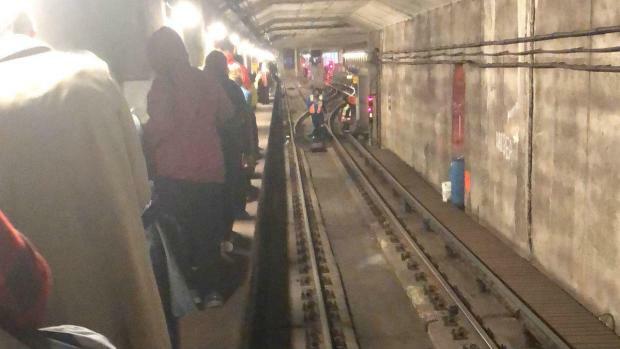 Blue Line trains resumed service early Thursday morning hours after a derailment near O'Hare Airport injured a woman and forced dozens of passengers to evacuate. The derailment happened around 7 p.m. Wednesday suspending service on the popular line between O'Hare Airport and Rosemont. A 39-year-old woman was taken to Resurrection Hospital with a back injury, authorities said. Seventy-three passengers were evacuated from the train, the Chicago Fire Department said. By 2 a.m., normal service resumed on the line, but the transit agency still warned of residual delays for commuters.